This is a "theme" tree and I got the idea for this tree because my husband loves NASA and astronauts and moon landings, etc. We both grew up in the 60’s and 70’s and we were glued to the TV for every launch and every splash down. We both remember every moment of that late night broadcast when man first set foot on the moon. Really Hallmark started it. 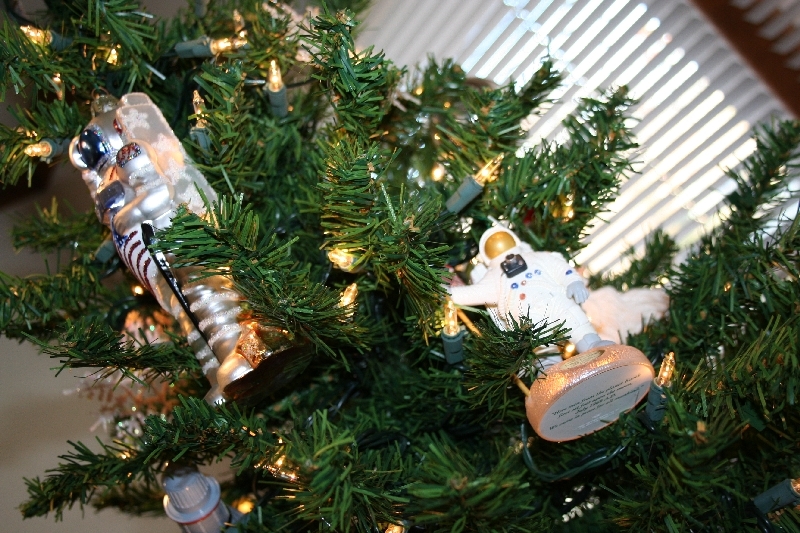 They came out with a series of ornaments to commemorate significant moments in NASA history. My friend Beth had a couple of them and once I saw them I was hooked. 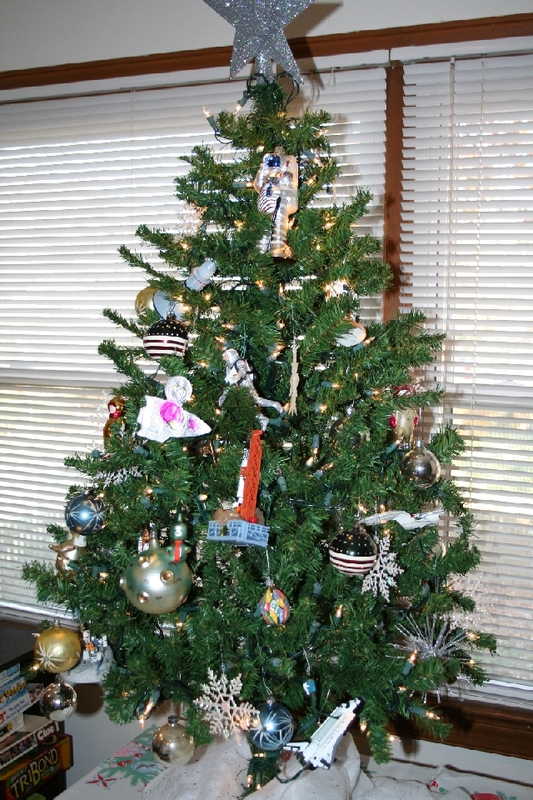 We call it the "Space" tree and this year it resides in our game room. 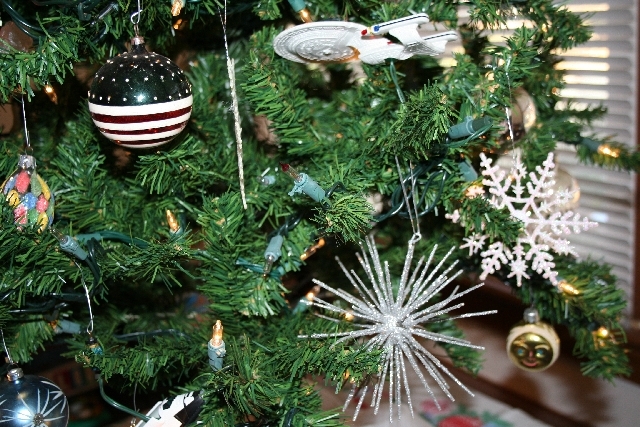 When you power up the tree it launches into outer space because each of the hallmark ornaments has a recording of actual audio from that moment in time. I try to add something to it each year. Most recently I added this german dresden of an astronaut in his space ship. 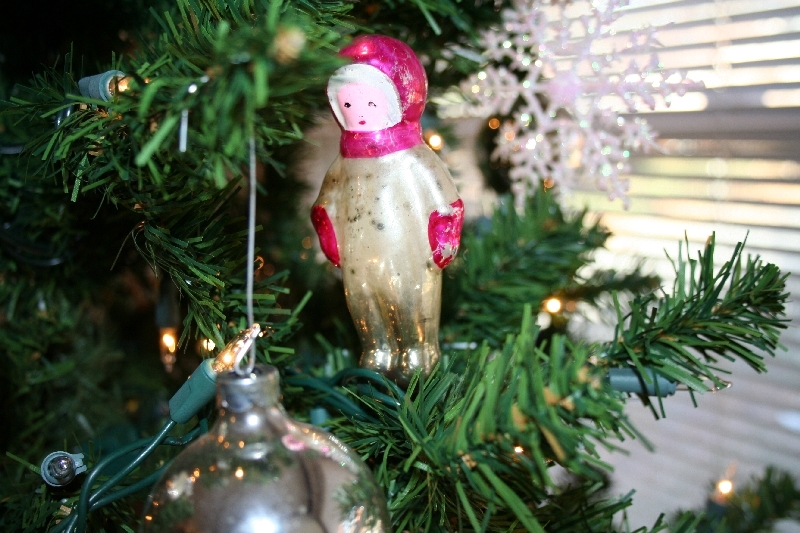 Several of my most prized vintage ornaments reside on this tree. I found this italian blown glass "man in the moon" and astronaut at an estate sale in New Jersey. These patriotic orbs showed up in a box from a thrift store somewhere. They are quite old but I haven’t discovered their origin yet. Gotta have a little Star Trek in there! 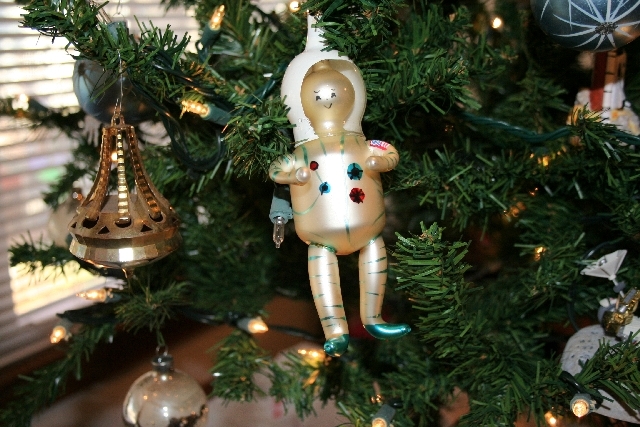 This cosmonaut ornament is from Russia of course! 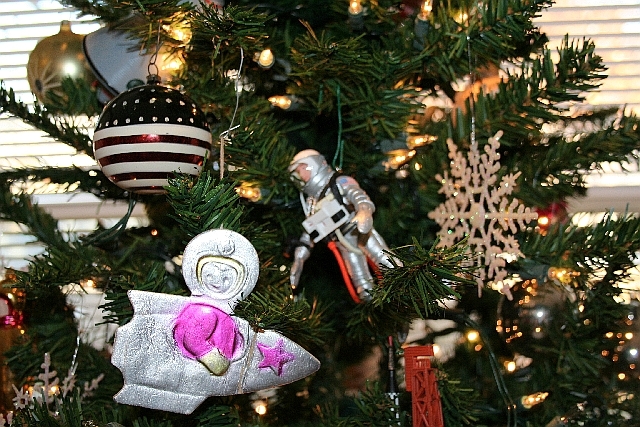 Astronauts are pretty popular themes for ornaments I have found. Anything that has a star, or rocket or moon theme works well on this tree. I hope you enjoyed your voyage around my Space tree. Time to blast off this computer and get some work done, my guests are coming!! Yikes, I haven’t wrapped a thing! This is a great tree! 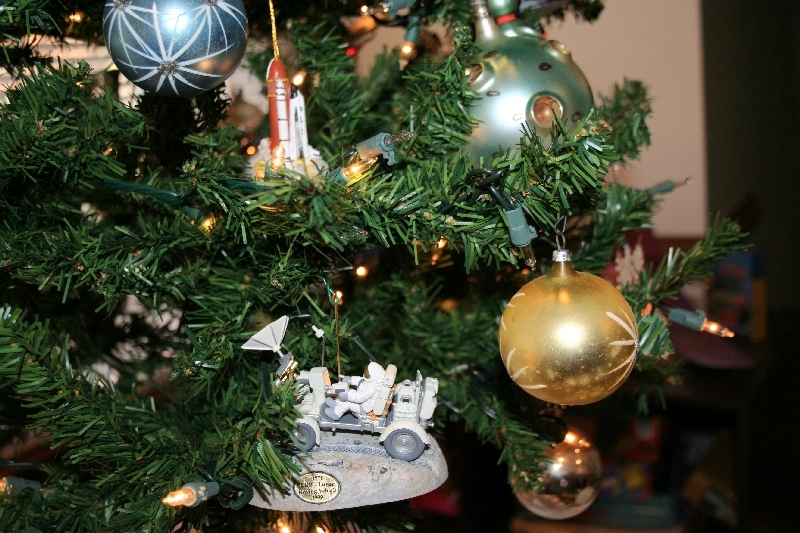 Love your range of different space-related ornaments! Even though I said I don’t “do” Christmas any more, I still buy one or two special ornaments each year, especially if I find a different Christmas Pickle design. And I always try to look for a sparkly red (non-breakable) ornament to hang in my red Wrangler each year. So I guess I have a “sort of” theme to my non-Christmas. I DO enjoy seeing what others do for Christmas, so thanks for posting so many beautiful pictures. These are great! Leroy would LOVE this tree!!! Thanks for the space odyssy. It was a real treat. Strange but true, I’m sitting at my computer wearing a t-shirt from Cape Canaveral. It says “I need my space”. I adore this tree! I did my masters degree in space studies and did 3 internships with NASA in college. This tree is definitely right up my alley! What a neat theme for a tree! I love that man in the moon ornament. What great decorations – you certainly have a neat and different theme going on there! Hope your Holidays are merry and bright – blessings for a joyful Christmas. WOW! You make rocket science look easy! Great tree! This is SO cool! I’m a bit of a “space” freak too and know way too much about the Mercury 7 program and other weird space stuff. OH! I just had a great idea! (not telling). 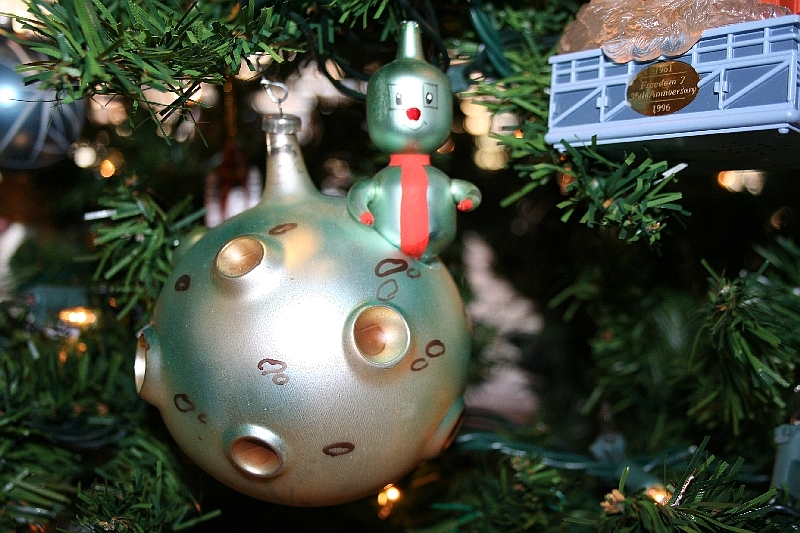 I would never have known they made such great “space” ornaments! I love the little cosmonaught, so cute! AND I quite agree with you on many of your 12 RANDOM christmas facts about you including the Mimosa’s, Christmas at home, Christmas tunes from Thanksgiving to December 25th, and of course the classic Chirsmas movies! You so know how to do it right!! FUN!!!!!! I love it, how cute! What a fun tree! Hope you and yours have a very Merry Christmas and bright new year.